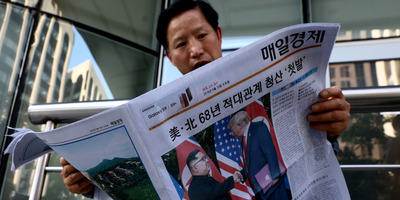 Chung Sung-Jun/Getty ImagesA South Korean man reads a newspaper reporting the US President Trump meeting with North Korean leader Kim Jong Un on June 12, 2018 in Seoul, South Korea. The goal of denuclearization is just as far away as it was before President Donald Trump and Kim Jong Un met, a national security expert told Business Insider. Trump has praised the “great progress” he and Kim made towards denuclearization at Tuesday’s summit in Singapore. But the joint statement the two world leaders signed is little different from April’s Panmunjom Declaration and years of pledges from North Korea. 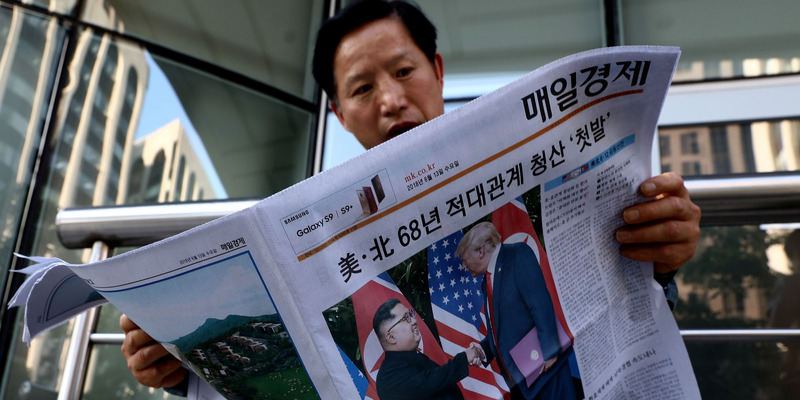 Despite a joint statement signed by President Donald Trump and North Korean leader Kim Jong Un, the goal of denuclearization is “just as far off today as it was yesterday,” a national security expert has told Business Insider. And since leaving Singapore, the president has tweeted that “great progress was made on the denuclearization of North Korea.” “The world has taken a big step back from potential nuclear catastrophe! No more rocket launches, nuclear testing or research!” he also tweeted. But Ned Price, who served in the Obama administration as a special assistant to the president and as a National Security Council spokesperson, told Business Insider that in reality essentially nothing has changed. “Diplomacy will always be better than war, and we should hope that continued engagement moves the ball forward toward denuclearization. But that goal is just as far off today as it was yesterday,” Price said. In a press conference, Trump said he spoke with Kim about verifying any denuclearization, a longstanding staple of the US’s policy, but said there was “there was no time” to include those details in the statement. And North Korea has offered strikingly similar pledges before – the first being made 26 years ago. “We shouldn’t pretend we haven’t seen this movie before. We have. We know how it could end unless the Trump administration is capable of writing a different ending. Nothing we’ve seen to-date should give us confidence that’s the case,” said Price, who served in the CIA for 11 years before but resigned after working under Trump and is now the Director of Policy at the think tank National Security Action, which opposes some of Trump’s foreign policies.